Happy Halloween from Compliance Culture! In honor of the holiday, check out this round-up from American Banker on the scary regulatory outlook for the banking sector: Here’s what bankers are fearing this Halloween season. The Myers-Briggs Type Indicator (MBTI) is a set of personality types that categorizes individuals’ experiential preferences. 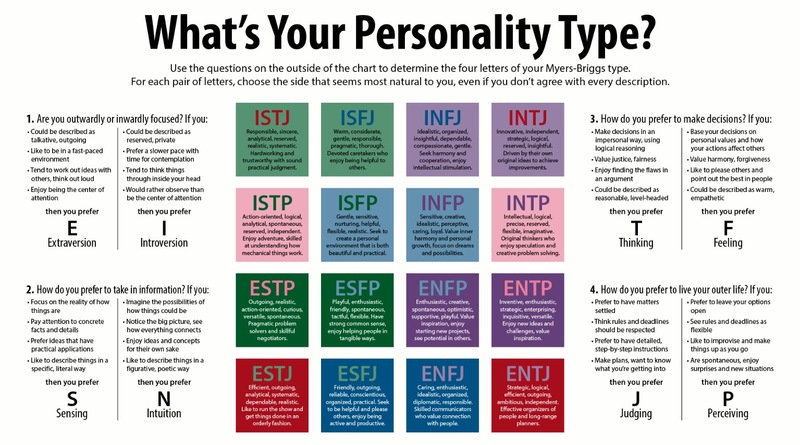 The MBTI has become very popular for use in business settings, for managers to determine how to develop employees or build teams as well as for individuals to analyze their own way of working and define their particular world view and tendencies in interacting with others, based on these preferences. The MBTI classification system is fundamentally based upon the presumption that humans have four main psychological functions, or dichotomies, through which they view the world. These are thinking (T), feeling (F), sensation (S), and intuition (N). Thinking and feeling are the functions people rely upon for judgment in decision-making. Sensation and intuition describe how people perceive new information. Taken together, one of these four functions will be naturally dominant for each person the majority of the time. Added to these functions are people’s attitudes, expressed by the terms introversion (I) – a preference to operate internally, focused on reflection and ideas – and extroversion (E) – a preference to operate externally, focused on behavior and people. This relates to how people prefer to live their “outer lives” and is not necessarily as simple as defining a person as “shy” or “outgoing” but looks deeper into how people get or spend their energy and whether their information-processing, personal focus, and pace is determined inward or outward. Finally, the MBTI also incorporates lifestyle preferences, identifying that people have preference for using either the judging (J) functions (thinking or feeling) or the perceiving (P) function (sensation and intuition). These eight psychological functions and preferences – four sets of two each – can be mixed and matched among each other in different combinations, resulting in the sixteen MBTI distinct “personality types.” In any given group there is likely to be some mix of these types, sometimes more diverse than others. Each type brings with it some indications for the person may behave in an individual or collective setting. Therefore understanding the elements of these different types can be useful in fine-tuning messaging to have maximum appeal to one, some, or all of them. Based on the above, there are four dichotomies to the MBTI. In each dichotomy, individuals select from two letters (T for thinking versus F for feeling, for example) the one which most accurately, if not completely, seems most accurate in depicting their personality types. The differences between these four dichotomies are important to understand and useful to take advantage of in tailoring communication across organizational levels to raise compliance awareness. Introversion (I) or Extroversion (E): Preference for Introversion suggests an inward focus, with more contemplation and observation in learning or gathering information. I types would enjoy e-learnings, reading guidelines and policies, or other self-paced activities. Preference for Extroversion, on the other hand, indicates a suitability for fast-paced outward focus. These are the eager participants in dilemma sessions or group trainings who like to work with others and develop their ideas out loud, getting energy from quick progress of talking through learning materials. Sensation (S) or Intuition (N): Preference for sensation means that concrete, practical information will be the most appealing to these individuals. Communications should use clear and literal descriptions based in reality. Those who prefer intuition, on the other hand, may be more likely to dream about what could be rather than what is. Contemplating business cases and dilemmas would be fun and enjoyable for them. Thinking (T) or Feeling (F): Those who lean toward Thinking will respond to decision-making that is promotes rationality and justice. A rules-based approach to communicating compliance principles will evoke their sense of reason and equity and make the objectives relatable. On the other hand, people who prefer Feeling will benefit from a values-based approach. Playing up personal morality and situational empathy is more effective for them. Judging (J) or Perceiving (P): Judging is aligned with a preference for planning and methodical assessment. These people will be convinced of the value of a compliance program by, for example, formal risk inventories and control framework evaluations, and coordinated, long-term implementation plans with steps and phases for their goals. People who prefer Perceiving, on the other hand, need a flexible view. This is challenging to adapt to fixed rules and regulations, but offering creative approaches to those can be an engaging possibility. For more information on the MBTI and its four dichotomies, check out this handy interactive chart. In a follow-up to yesterday’s post on current compliance trends in the emerging autonomous vehicle technology industry, the below is a collection of videos from TED and TEDx talks about self-driving cars. The possibilities of this technology at this point, its infancy, seem almost infinite. The impact autonomous cars could have on modern society and culture are fascinating to contemplate; it seems like this technology could disrupt and indeed improve people’s lives in many ways. First, a primer on the technical basics of the self-driving car systems that are under development now, and the machine learning and artificial intelligence technology that will be imperative to make it practical and affordable, from Self-Driving Cars of The Near Future (Raquel Urtasun). Of course, along with the tremendous potential of this autonomous vehicle technology also comes risks and decisions that must be carefully and thoughtfully made with compliance and ethics considerations in mind. In developing a technology that will have such a wide-reaching impact on so many people, both those who use it and those who do not personally do so, it is critically important to have in mind from the beginning all the interests concerned and how those might be conflicting or impacted. Autonomous ride toward a new reality (Limmor Kfiri) – The benefits of self-driving cars must be taken alongside the issues and ethical dilemmas they prompt. In considering these challenges – which include, for example, cybersecurity risk in the possibility that someone could remotely hack a car’s self-driving technology system and take over control of the steering or brakes from the human inside it – creative approaches for handling the problems without stifling the technology are necessary. Governments and individuals who are involving in the designing phase can have a huge impact from the beginning in this effort. The Overlooked Secret Behind Driverless Cars (Priscilla Nagashima Boyd) – There are many very practical problems of driving that technologists hope self-driving vehicles can help to address. For example, which route to select for the best commute or where to find a parking spot are all decisions people must make when driving now that semi-autonomous or autonomous driving systems could take care of in the future. However, with these conveniences there are some serious potential effects to privacy. People must ask themselves whether they are comfortable with location sharing, for example, something which has been an uncomfortable subject for some with social media or smartphone apps already. This may require a change in attitude and expectations toward privacy, and a heightened trust in technology, that during this time of cybersecurity breaches and leaks, some people are not so eager to normalize. What’s the perfect driverless car? It depends on who you ask (Ryan Jenkins) – Design ethics and artificial intelligence meet in the development of the technology for autonomous vehicles. Technologies which can so deeply impact human life – such as smartphones, software algorithms, and indeed self-driving cars – bring with them many moral questions about what the character of and oversight on that impact might be. Any technology which can transform the way people live can do so helpfully or harmfully. Therefore, designers, engineers, lawmakers, and compliance and ethics professionals must collaborate to ensure that autonomous vehicles are produced so that they will meaningfully and positively shape human lives. Are we ready for driverless cars? (Lauren Isaac) – Maybe the technology for driverless cars is great, but what if humans are the ones who are not ready? Like all systems, it can be designed with all the necessary controls and considerations in mind to make it as safe as possible, but if people do not use it appropriately or with good intentions then everything can go wrong. If people are not prepared to share with each other as well as redefine some of their inflexible ideas about ownership and control, then the technology will struggle to succeed in its bolder ambitions for society as a collective. Lawmakers and regulators can intervene early to ensure the philosophical intention of the driverless vehicle includes that people are safe and their interests are served, rather than neglected or abused, by the technology. Are we ready for the self-driving car? (Tyron Louw) – While the previous lecture addresses people’s behavioral capability to handle self-driving car technology, in their attitudes and their openness to change and responsibility, this one focuses on people’s performance capacity. People are often frustrated when their laptops freeze or their phones have a dead battery – how will they react in the moment if a self-driving car has a technical malfunction? How can driverless vehicles be designed to take into account the possibility that the unsafe part of a self-driving car is the human driver in or near it? The potential of the technology for autonomous vehicles, as expressed in these lectures and many others, is so striking, that it would be an inexcusable loss to not manage its growth and advancement in a way that ensures its sustainability. In the absence of regulatory action, and with tremendous respect for and power to the unchecked ambition of innovation, organizations and individuals working in this space must takes a value-based approach to developing, testing, and launching this technology. This way, its risks and challenges can be properly controlled against, and its greatness can be realized. The science fiction world of the future is in active development. Projects involving artificial intelligence are on the forefront of the business strategy of many Silicon Valley technology companies and the venture capital firms that finance them, as well as traditional automotive companies and electronics manufacturers. Advancements in automation are the focus of major investments by these organizations, all of which hope to stake a competitive claim in this disruptive market. Artificial intelligence innovations and specifically those involved automation do include robots and computer-generated personas serving functions ranging from assistants to recruiters to reservationists like the writers of earlier decades once imagined. However, one of the more practical applications of this emerging technology is in the transportation industry. Self-driving cars offer fascinating efficiency and improvement possibilities for a world that is increasingly urbanized. Organizations working in the self-driving cars industry all hope to address the constant dilemmas within the automotive industry – design and production safety, environmental sustainability, distracted driving, how to handle congestion and commuting. Of course, as this advanced technology develops, obvious compliance and ethics considerations emerge. Consumer protection, safety and privacy, design ethics, and regulatory response are all challenges which business interests in the self-driving car industry must confront. one of the Many of the challenges of modern society in general are writ large in the world of higher education. Check back tomorrow for a companion post to this round-up: selected TED/TEDx talks on self-driving cars and what autonomous vehicles may mean for individuals, organizations, and society. The term “mergers and acquisitions” describes transactions in which the ownership of organizations or business operations within organizations are combined or transferred between companies. Merger describes the combination of at least two organizational units, whereas acquisition describes the transfer of interests or assets from one organization to another. So far 2017 has been a banner year for high-profile mergers and acquisitions across all industries. Businesses are generating attention, press, and perhaps even revenue for themselves by ambitiously entering into deals with one another. Some prominent competitors have decided to join forces, while other companies hope to make inroads into new markets or gain access to new technologies through mergers and acquisitions activity. One conclusion that may be drawn already so far from a survey of this year’s mergers and acquisitions activity is for some, that expediency is the name of the game. Companies entering into these agreements want to come together quickly to get on with business, before the advancements in technology outpace their own participation. In some markets, regulators seem basically happy to oblige them. This apparent trend stands somewhat in contrast with standard regulatory agenda for existing companies, and the current preference in other markets, which is to identify and investigate possible anti-trust business practices for possible enforcement action or remedial measures before allowing the deal to go through. If the US regulators continue to take the point of view that combined and strengthened competition from one market player drives the rest to be better and innovate, such as with Amazon, this will be a justification of relaxed regulatory scrutiny. It will be interesting then to observe whether regulators in the EU or other regions trend in the other direction, increasing the scope and standard of their oversight in order to reinforce their opposite protection that in these times of combination innovation may actually be more at risk than ever. Only time will tell in this case which side has predicted the outcome correctly; one may find commerce stifled in name of caution, while the other may discover that imposing supervision after the union is more difficult than taking a measured approach from the beginning. Compliance and ethics are related but separate disciplines. In a professional setting each one relies heavily upon the principles and practices of the other, while still maintaining its own distinct character. Compliance concerns not necessarily the intuitive or collective ideas about right and wrong, nor the legal bright lines about what is permissible or prohibited, but rather the decision points between all of these. The function of compliance in a practical sense is to adjust or create conditions to choices in order to analyze or bridge the gap between good and bad, yes and no. In compliance, ethics provides the values-based approach, while the legal and regulatory guidance provides the rules-based approach. The work of the compliance professional is to attempt to reconcile the two and in that work create a second set of connections, this time between that which is legally acceptable or not, and that which is deemed ethically appropriate or not. Very simply put, ethics, on the other hand, refers to the standards of behavior by individuals or organizations and the moral principles governing the conducting of an activity by the same. This is a values-based approach to “right” and “wrong,” or what is good for people and the society in which they live and work. The concept of right and wrong behavior is fundamental to ethics and acts as a systematic discipline in order to guide decisions on how to act. Ethics draws its foundations from five branches, each one of which is useful to inform a practical and discipline perspective for a corporate compliance program. Normative ethics contemplates the questions which arise in consider how one should act morally, in line with the norms and expectations of society or a community/organization in which the actions are taken. What are the different interests at stake and what are the potential consequences and outcomes of the possible actions to be taken? This view is very helpful in ethical decision-making and designing defense strategies to encourage identifying and choosing good decisions while discouraging and removing incentives or rationales for bad decisions. Meta ethics focuses on what morality actually is and means – in general as well as in context. This involves the careful analysis of the level of understanding about moral considerations as well as an analysis of the situational status and scope of it. This approach is imperative for defining a values-based culture and corresponding corporate identity and business strategy. These values must be organic and intrinsic from the beginning in order for them to truly imbed as genuine. If they are imposed upon the business culture with no respect for what original standards were set for the organization at its inception, then a values-based approach to a culture of compliance will not permeate the company’s actions- customer service, product design, hiring and retaining employees – and a strong tone at the top cannot succeed. Applied ethics goes in-depth into the practicality of really using ethical theory in order to analyze actual moral issues in both private and public life. The practical skills inherent for this discipline are incredibly useful for creating the dialogs that support compliance awareness. Taking a critical look at real-life moral issues that would be encountered in one’s personal time or on an everyday basis at work is a very useful way to get comfortable with approaching ethical dilemmas. Dilemma analysis and discussion is key for encouraging a robust culture of compliance at all organizational levels. Moral ethics is the philosophical area of ethics that centers on defining, choosing, and suggesting behavior with classifications of “right” and “wrong” in mind. This practice is the most directly influential in determining standards and expectations for conduct. Elevating moral conduct by clearly defining it as a corporate cultural norm is imperative for encouraging employees to value it as such as well. Senior leadership should genuinely demonstrate this as well, acting as good conduct role models to embody the cultural values and categorizations for understanding the difference between right and wrong and making good choices within that dichotomy. Finally, descriptive ethics is the study of attitudes of individuals or groups of people aimed at characterizing and understanding their beliefs. The objectives of this branch of ethics are very important for compliance risk management because they help to expose heuristics and routines in play that may encourage or hinder ethical decision-making and the cultivation of strong compliance themes within the corporate values. This is crucial for providing positive support for organizational and employee integrity. Given the above, there are great affinities between the principles of ethics and those of compliance. The two disciplines share prolifically in their application in life in general and specifically in the workplace. It is very useful for compliance professionals to have some foundation in the discipline of ethics and an understanding of the practical application of its system of principles.